On Tuesday March 12, 2019 ISA-CM and the University of Sousse organized with great success a business forum on the subject of “Livestock Production in Arid and Semi-arid Regions Facing Climate Change”. Nine accomplished scientists participated as speakers and had the chance to develop topics which concern the business world in Tunisia. During the forum scientists, academics, students and professionals had the chance to interact and exchange opinions and point of views. Members of the CLICHA consortium from Greece, Italy and Latvia were present in the event either as speaker or as participants. More than 150 people registered to the event. On March 13-14, 2019, the DESSINO kick-off meeting took place in Athens, Greece. This Erasmus+ project aims at DESSINO project seeks to provide an infrastructure for the development of design education by the establishment of three Design & Innovation Centres in Indian Universities and through a systematic collaboration of academia with industry. These centres will facilitate the development of improved design courses that will encompass product and service design by following state of the art methodologies in design thinking, sustainability, design research, social innovation, ethical issues in design, etc. Faye Plakantonaki the project manager of CLICHA: Climate Change in Agriculture and Dimos Papakonstantinou member of the consortium with CRE.THI.DEV. had the chance to present the main aspects of the project and share their experience concerning its implementation. On Monday, February 18, 2019, the opening of the FOSTEX kick-off meeting took place in Terrassa, Spain. The project aims at the establishment of two advanced textiles’ centers in Jordan universities and upgrade textile centers in Morocco in order to promote the textile sector in these countries via: (1) boosting competitiveness by lowering production cost, increasing productivity, developing quality and design, and implementing international conformity certification; (2) maintaining and increasing the local market share and creating a stronger image of the “Made in Jordan” and “Made in Morocco” products in comparison to Chinese/Asian products; (3) supporting exports to surrounding markets, mainly European, US and Arab markets; (4) exploring niche manufacturing opportunities (i.e. specialized products such as advanced/high end textiles) where the competitive advantage is not the price. The kick-off meeting ended February 20, with the presentation of the Textile Research & Teaching at Universitat Politècnica de Catalunya and a visit to Textile Section Facilities in ESEIAAT and INTEXTER. “Zootechnia” is the only specialized event in Greece and the Balkans, regarding livestock and poultry and it was held for the 11th time from 31 January to 3 February at the Thessaloniki International Exhibition Centre. All major businesses were present, and they presented the latest developments in the sector; everything from the most important food producing animals to machinery, equipment, services and research. The exhibition marks developments in a very dynamic primary production field and establishes the new standards of a sector which, in early 2019, will go through a period of improvement-plan approval, which will lead to investment and action implementation acceleration in the livestock-poultry sector. “Zootechnia 2019” continued the upward trajectory recorded by the corresponding event of 2017, which proved to be the best ever, breaking records in visitor and exhibitor numbers. The CLICHA project was present in this event at the pavilion of the Agricultural University of Athens (AUA). The pavilion was staffed by the Department of International and Public Relations of the AUA as well as volunteer students and staff who distributed printed information material and informed the visitors. During the exhibition, the pavilion of the University was visited by the Deputy Minister of the Hellenic Ministry of Agriculture, Mr. V. Kokkalis, the Region Directors of Epirus and Thessaly, Mr. A. Kakrimanis and K. Agorastos, representatives of organizations, journalists of the agricultural press, many professionals, producers and visitors interested in learning about the actions that are implemented the AUA, including the CLICHA project. Dr Daniele De Meneghi, member of CISAO_UniTo, CLICHA partner, has partecipated in the 7th REEV-Med General Assembly (REEV-Med: Mediterranean Network of Establishments for Veterinary Education; http://www.reev-med.org) coupled with the Mediterranean Veterinary Congress, in Kirikkale (Turkey). The venue was at the Veterinary Faculty, Kririkkale University, on 13-14 December 2018. 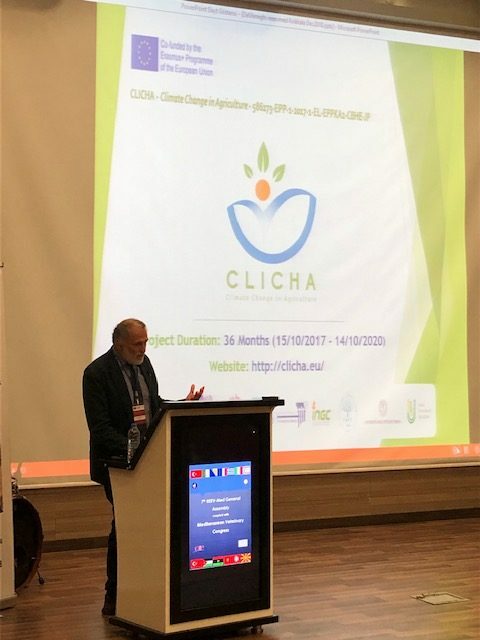 Dr De Meneghi gave a presentation on CLICHA project providing an overview of the activities so far carried out by the CLICHA network, including experiences gained and good practices applied in project management. The presentation raised interest amongst participants, questions were asked and a fruitful discussion took place.